Part 2 of a long look back at the heritage of landscape and plein air art that we artists enjoy today nd from which we can draw encouragement and inspiration, as well as instruction. Silk has always been my favourite material, sensuous to wear yet so practical and comfortable in all weathers. It is always beautiful, whether patterned, plain, embroidered or subtly woven with textures in it. Even its names - shantung, habutai, tussore, chiffon, taffeta, dupioni, tussah - sound exotic and alluring. One of my earliest connections with silk was the realisation that mulberry leaves, from a tree that I loved and knew well at my home in East Africa, were what feed the silk worms for 35 days, before they are ready to spin a cocoon with their continuous fine silken thread that eventually measures over a mile when it is carefully unwound, prior to being woven into cloth. 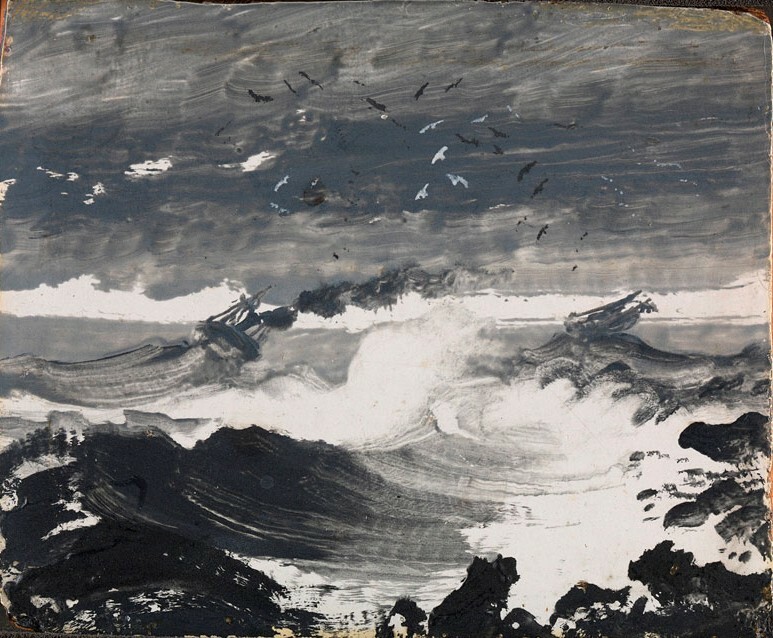 Peder Balke is not the name of an artist that readily springs to mind, yet he is now considered the pre-eminent Norwegian artist of the 19th century. His landscapes and especially seascapes, highly unusual in their techniques, are now justly celebrated. I was lucky enough to see an exhibition of his paintings at the National Gallery, having seen a smaller one of his work in the same rooms four years ago. Balke lived from 1804-1887, started out as a full-time painter and then had to turn to other ways of earning his living. Nonetheless, he continued to paint, for his own pleasure, experimenting and using paints in ways that heralded modern expressionism. He travelled to the North Cape in Norway, an area of dramatic coastlines and radiantly strange light of the Arctic Circle. These scenes continued to influence him many years later. He did not always paint specific scenes, but used the moods and impressions of nature, often in almost abstract fashion, to convey the majesty, mystery, solitude and power of the natural world. While the larger paintings on display in the National Gallery exhibition were impressive, especially the highly atmospheric ones of Northern scenes, done in the 1870s, the ones that fascinate me are the tiny ones. They pack a punch, almost in a visceral way. They are indeed small, mostly blacks and white, seascapes and some landscapes of glaciers or waterfalls, often almost abstracts. They are not small, however, when it comes to impact. 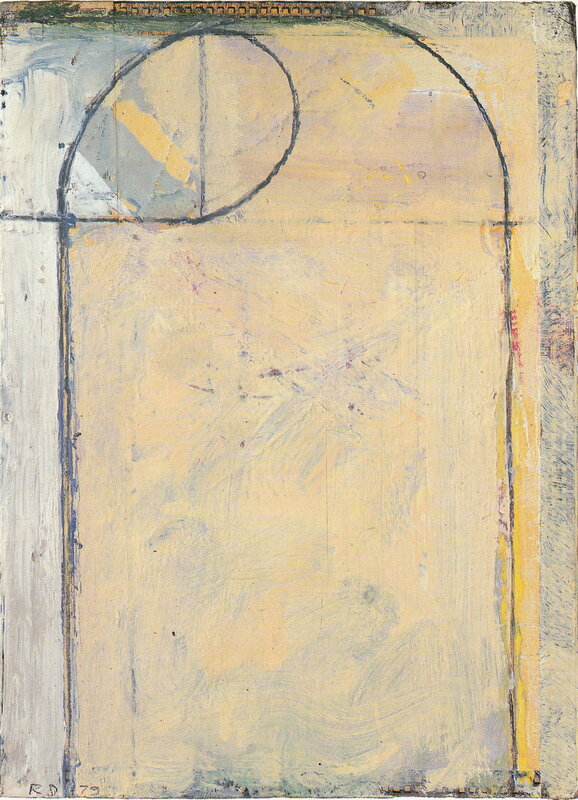 Their effect is perhaps more powerful than that of many of the larger paintings he did. Perhaps my love of monochromatic works leads me to them, but to me, they are stunning in their big voices coming from very small rectangles of oil on cardboard or oil on board. I wonder if other people find them as arresting as I do? Savannah's Telfair Museum of Art has just opened an unusual and most interesting exhibition, Dutch Utopia. Using art already in the Museum's permanent holdings as a springboard, curator Holly Koons McCullough and her team have assembled a large number of works by American artists who worked in artists' colonies and small unspoiled villages in the Netherlands during the second half of the nineteenth century. There are plenty of canvases large and small by artists who remain well known today, from John Singer Sargent to Robert Henri and William Merritt Chase. Then there are the delights to be savoured thanks to many artists whose names are less familiar today, from George Hitchcock to accomplished women artists like Anna Stanley and Elizabeth Nourse. Traditional compositions of landscape or interiors suddenly change to daring works which feel much more contemporary to us today. Watercolours hold their own with oils on canvas, some huge. It is an interesting mix of works and takes one to a totally different time and place, in a tight society living beneath amazingly luminous Northern skies, where wind and sea dictate every aspect of life and, according to one contemporary comment, there is a great deal of the colour blue in sunlight. The American artists lived there for varying lengths of time, but they all seemed to concentrate on eliminating from their work any hints of the changes that Europe had been undergoing as the Industrial Revolution reached its zenith. The Holland they portray had barely changed from the work Rembrandt and Franz Hals knew. 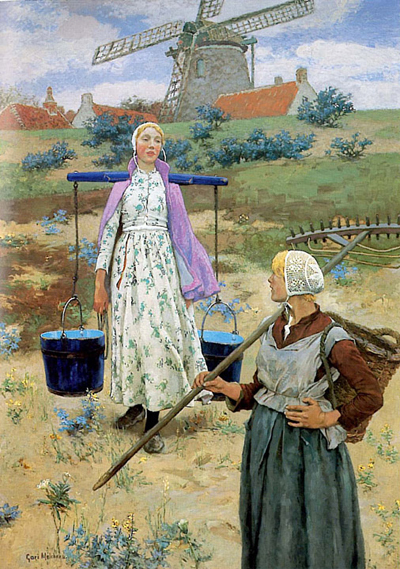 I found myself contrasting many of the scenes of Dutch women, be-coiffed and be-clogged, monumental and utterly Northern, with those by the Pont Aven school of artists who were depicting the Breton women with their typical coiffes and, yes, clogs too, on occasion. Working at about the same time, Gaugin, Sérusier, Emile Bernard and a host of other French artists were working in the sleepy little Brittany towns of Pont Aven or Le Pouldu. They were, to my eye, far more adventurous in their approaches than the Americans in the Netherlands, but each community produced some wonderful art. The Telfair's exhibition runs until January 10th, 2010, before moving to the Taft Museum of Art in Cincinnati, the Grand Rapids Art Museum and the Singer Laren Museum in the Netherlands. It is well worth seeing at one of its venues.